Is the 760 a worthy upgrade from the already popular roomba 560? In a nutshell, the roomba 560 is already a great product with a 1-2 remaining quirks after so many iterations of irobot, bugs should be fairly bedded down by now. 1) a larger better designed bin "Aero Vac 2"
X) NO bin full indicator - my apologies, only the 770& 780 have this. 6) doesn't get stuck as often on a rug - in fact, hardly ever. Apart from that both the 760 and 560 have the same dirt detection and scheduling features. Whether you think the price difference of $80-100 is worth the upgrade is your call. Roombas 770 and 780 offer a better upgrade with a redesigned dirt detection system 2 (noticeable improvement) and a bin full indicator. Model 780 has the further upgrade to touchscreen controls which to me is redundant (more electronic parts means more...), comes with two lighthouses and is shipped with additional filters/ brushes. At first it appeared to me that the better value upgrade would be the 770 but this does not have Room to Room navigation facilitated by 2 lighthouses like the 780 does - and that is an essential feature if you have large (sectionable) area size to clean. 770 on the other hand comes with a Virtual wall. Update: If you are seeking your first purchase, and decide NOT to go for the 700 series, you should do very well to purchase the 580. But spend the extra bucks if you can on the 700 - you won't be disappointed. It's superior navigational system aside, this baby negotiates around and over shag rugs with ease without getting stuck. IF YOU ARE willing to look further afield, (which I belatedly discovered) take a look at the LG Roboking 5902LVM & later models. If I hadn't already commited to the irobots I would definitely take another serious look at one of these. It uses a methodical zig zag navigation system to clean and finishes in 20%-30% the time it takes iRobot to finish in it's algorithmically computed random pathways - though longwinded, iRobot's method is more thorough and ensures that each cleaning cycle covers a spot at least 3-4 times based on need. If Roboking runs out of battery halfway through a clean, it remembers goes and recharges itself and then auto resume where it left off. Roboking's bin is simply lifted up like a contained pail leaving no droppings unlike the OLDER iRobots 530 included which suffers some spillage each time you remove the bin for emptying. Roboking's batteries are Li ion. It is energy efficient. It is quieter at 48-50dB - iRobots slightly noisier at 60dB but that's just marginal. Amazon.com please do consider stocking the LGs and the 770 & 780. I haven't owned any LGs but from the reviews and YouTube demos, this is a winner. The very latest gen RoboKing apparently goes as far as having a third optical eye with wifi capabilities and does open web-streaming via your home or iPhone wifi. Frankly, though it allows for remote controlling via your iPhone and remote viewing on what's going on at home...the question is will there be security breach or nasty implications of intruders-to-be hacking in and using it for subversive surveillance instead. LG needs to ensure there is no risk of the customer household being the next reality webshow. HAVING SAID THAT, I LOVE MY ROOMBA 780 which I purchased due to it's online availability at the time! ...and in hindsight wouldn't trade it for the world. The two included Lighthouses/Virtual Wall are immensely useful in sectioning your floorspace into 2-3 sections for more effective cleaning. The more I use it the more I like it. iRobot would perfect the deal if all the 780 came with Li-ion batteries. 5 stars to the Roomba 700 series. I am a convert. I saved up and bought this Roomba for my enclosed patio when both of my Dirt Dogs passed away and IRobot stopped making them....sigh....I really miss being able to use the Dirt Dog to sweep outside and in the garage. The IRobot people said this unit would work just fine in those areas, but I'm not going to put something I spent this much money on to clean up dropped screws and leaves! That said, I like this Roomba very much in our enclosed patio. I LOVE the two HEPA filters, which are easily blown out with a can of air or compressor after a vacuuming sesson. They're picking up a lot of dust that my regular vacuum misses....Ok, that I miss when I'm using the regular vacuum, which also has a HEPA filter. They pick up feathers and seeds from the birds, and lots of hair from the cats and dog. Mission accomplished. It does a nice job of moving from hard surfaces (concrete, in this case) to rugs, and cleaning them all well. Technology is really improved in this unit. For one thing, it gently bounces off things, rather than whacking into them. I'll be a lot more comfortable using it in the house around my antique furniture. It docks itself when it's getting low on battery power, or you can push a button to have it dock manually. It can be programmed to run on specific days at specific times (very cool). It will also spot-clean a small area at the push of a button. That comes in really handy when a plant gets knocked over. With a lower profile, this unit doesn't get stuck under furniture as much as the Dirt Dog. It also seems "smarter". The other day it went under the center cutout in a cedar chest and I watched it maneuver. The Dirt Dog would have just banged its head until its battery ran out. This one continued to work on the problem until it found its way to the high spot and back out into the room again. The edge-cleaner capability isn't great. I find I have to go back with a DustBuster and clean edges. Small area rugs at doorways or up against the walls get cleaned much better if I move them to the center of the room. But those are fair tradeoff for not having to drag out the vacuum and spend the time to clean the patio myself! - Roomba does a great job in empty rooms; the entire downstairs comes out dust free. - Works well under beds, chairs, wide tables, and kitchen cabinet toekick. - Has great sensors for walls, boxes, pillows, and goes beautifully over heavy rugs back onto hardwood. - Roomba didn't like the fringe on my oriental carpets, but it didn't choke on it like my big vacuum did and kept on going. - The electronic barriers work well, but there is a learning curve on how to place them properly (The signal is cone-shaped). These need 2 "C" batteries each (4 total, not included). - It is not difficult to maintain: emptying the dust collection, removing brushes and using brush cleaner, wiping off sensors, moving it to a new room. - need to watch Roomba do a room before you turn it loose unobserved; you simply don't know what works and what doesn't until you try it. - There is no owner's manual - you have to watch the DVD or go online to learn to use it. - Roomba got stuck its first time near the stairs (it had too much momentum and shot over the top) but does fine once it slowed down and approached it a second time. - Roomba consistently gets stuck under an end table whose legs are too close for passage - it seems obsessed with this table and goes back even after rescue. A pillow, book, or cardboard in front of the table solves this. 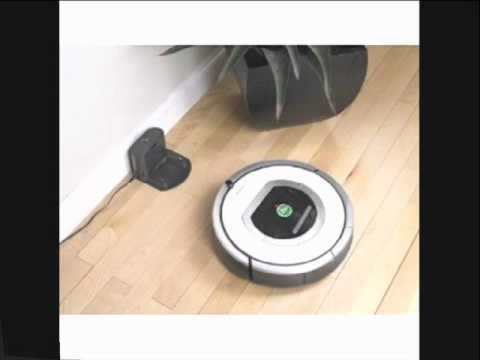 - Roomba's HEPA filters clog up really fast due to their location in the dirt collection cavity. Need 2 new filters every week with the amount of dust swept up. Overall, I love this little guy. He's fun to watch and and does a much better job than I do sweeping by hand. But he does require hands-on cleaning maintenance everytime you use Roomba. Performance goes down dramatically if you don't prepare the room, clearing obstacles like cords, set-up electronic and physical barriers, and do the required maintenance when he's done. Highly recommended. - Still going strong - no mechanical problems after weekly use for 7 months. - Roomba works significantly better one room at a time, so placement of the "invisible" walls does help. I believe the 780 model makes this possible without have to move the lighthouses around and moving Roomba's dock from room to room. - The HEPA filters are just about useless. They clog after one use and either have to be changed out or ignored. Hugely expensive if you really want HEPA filters to work. I usually knock as much dust out of the filters as I can when I empty the bin, but it is noticably cleaner in the house when new filters are inserted. - Roomba still has issues with cords. This is the biggest thing that I have to worry with - finding cords hidden under furniture that Roomba swoops under and then finds a cord.